View of the church of the Holy Sepulchre and other buildings in Bridge Street, Cambridge. The Holy Sepulchre is an example of distinctive Norman architecture in Cambridge. It also has an unusual round shape. It was built in c.1180 by the Abbot of Ramsey, who had been granted money to raise a monastery in honour of God and the Holy Sepulchre. Round churches have early Christian origins but they were also built by Holy Orders who were established to guard the Holy Sepulchre Church in Jerusalem. In the 15th century a chancel, aisles and a belfry were added. 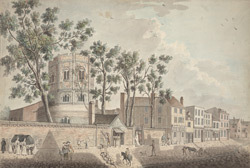 This shows the church before its complete rebuilding in 1841.